I was at a conference on Play over the weekend. Great job Childspace! There was plenty to affirm, challenge and inspire the 300+ audience from NZ and around the world. So, where are we humans at with understanding the importance of play for children’s development and how can adults support children best in accessing play and making the most of this critical part of life? Play is whatever a child is feeling an urge to do. Whatever meaning we as adults wish to glean or whatever names we wish to use (schemas, learning outcomes, value of play, dispositions …) children are doing it anyway. Whether or not we document or even notice it, children are still playing and gaining value, learning, creating connections with themselves, others and the world. Too often adults interrupt children’s play in a well meaning attempt to either “extend the child’s learning” or keep the child “safe”. Our society believes that adults are there to teach children about the world. This is to overstep our bounds and elevate our own importance far too high. The world is there to teach children about the world. Our job is to facilitate the environment and perhaps the child, though only as necessary – we have no place in facilitating the actual play, nor the learning. L E A V E T H E M .
Nathan Mikaere-Wallis didn’t mince words when stating that there is currently a vast difference between culturally-informed beliefs and research-informed beliefs about children, play and the role of adults. Children (in fact all humans) are story making machines. We are designed to seek out experiences, take in the information through our senses, make sense of that information through various parts of our brains and lay this “story” down for future reference. Only 30% of our genes are mapped at birth, 70% of our genome is adaptable – we adapt to the environment in which we find ourselves. This adaptation is mostly influenced by the primary relationships we have during our early years, along with the experiences we have with ourselves at our interactions with the world. Play facilitates this learning most effectively. When we are free to play in the way our brain wishes to learn our stress response system is in a soothed state such that we can access greater proportions of our brains and “learn more”. 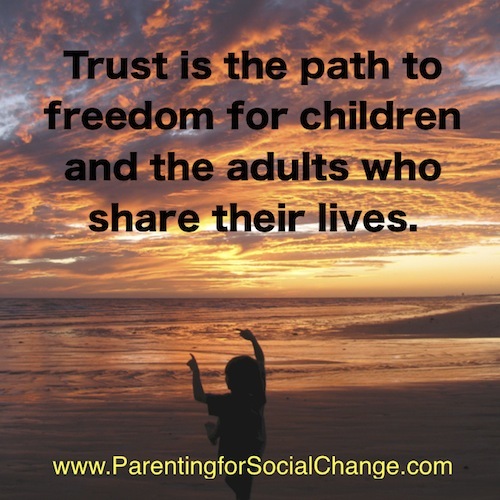 Our job as adults is to assist with stress regulation, supporting the emotional safety of the child so they in turn can be free to satisfy their natural desire to play. Full brain development occurs only when each stage of growth is honoured and supported through to completion. Skipping stages doesn’t help children in the long term (nor usually the short term either). When we try to make a 3 year old practice being a 7 year old (e.g. by teaching them to sit still on the mat and read and write and name colours and other facts) we rob them of the opportunities that BEING a 3 year old brings. We need to meet the needs of a 3 year old and step back while they do what they know they need to do as a 3 year old. And 3 year olds are total geniuses at EXPERIENCING LIFE. A world full of adults with the ability to soothe their stress response system, who have strong, stable, complete foundations and are able to access vast areas of their brains most of the time would be a transformed world indeed. Always accessible to us as adults and to children are stories and storytelling. Evelyn Davis reminded us of the magic that can be created by a storyteller who’s willing to give it a go, involve their audience and create life there and then. Our brains are ready and rearing to go with storytelling from about 3 years old and storytelling is ideally supported as a major form of play through the mid childhood years. Storytelling accesses many parts of the brain and encourages strong growth and development. Since we are “earthlings”, Pennie Brownlee (Dance with me in the heart and other wonders) challenged, children mostly need to be connected with the earth in order to truly experience and satisfy their sacred urge to play. An urge – yes an urge – a deep, primitive drive to live and love. Pennie, this is wisdom indeed. My workshop “Changing the World is Child’s Play” asserted that anything can be play. Play is an attitude. Normal everyday experiences together or alone can be play. Play is life. Life is play. Even staring into space is perfectly legitimate play. Furthering that idea, boredom is a valuable state to be in – from there creativity can arise. Childhood is the dawn of a new human – with all the risk and potential that entails. Child’s play impacts themselves, others, the world, and the future. Changing the world really is child’s play. What a weekend! I’ve gained so much understanding of new aspects of play and had the opportunity to connect with others who really get what child need – from themselves, from others and from the world. J U S T P L A Y ! My first book. This was born when I first realised what a privilege it is to be such a major influence in the developing lives of my children, and therefore out in the world. The foundations were being laid down with every interaction, every experience I had with my children and that was going to impact how they would later view themselves, others and the world. This was important stuff! I then realised that it could also be lots of fun – normal, everyday interactions and experiences could be turned into the greatest, gravest or most fun adventures and opportunities for play. Then the list began! From an original list of 400 experiences and ways of being around children, I culled and combined until I had 150, then 120, then 60 and then finally the 36 topics that made it into this first book. There are a further 36 awaiting inclusion in a sequel to this one for all those who’ve appreciated the ideas included in Changing the World is Child’s Play book 1. The Foreword was written by Miriam McCaleb and Nathan Mikaere-Wallis. Two very reputable child advocates and commentators and both stunning human beings. I felt very honoured when they accepted my request to write this acclamation. Please join me in delighting in the precious time we have with our children and acknowledge the extraordinary opportunities we have of shaping the future through our interactions and other choices. Please let me know all about your experiences of Changing the World through Child’s Play. I have a vision ... of all children respected as significant human beings, with appreciation for who they are and gratefulness for the many gifts they can offer the world. Kia ora Ako Books for the beautiful layout and printing this inspirational book in NZ! To order ask at your local bookstore, go to www.akobooks.co.nz or contact me. Sign up for updates on future books, blogs and ChildrenChange workshops and events.